Global smartwatch shipments for the second quarter of 2018 reached 10 million units, Canalys claims, with Apple continuing to take up a large percentage of global market share. 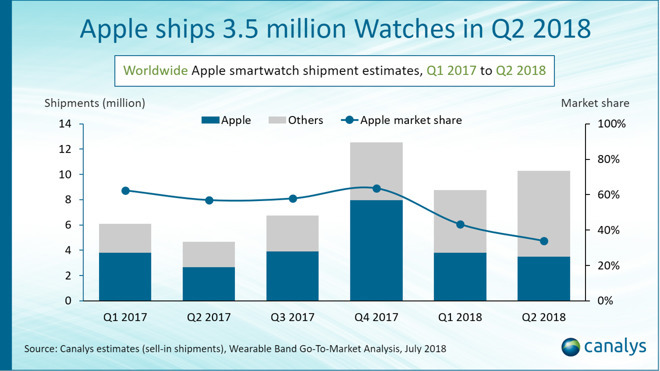 The claimed 3.5 million shipments is said to be an improvement on the same quarter last year, with Apple increasing the number of Apple Watches shipped by approximately 30 percent. Despite the shipment growth, the firm believes Apple's market share has in fact reduced down on a quarterly basis, moving from 43 percent of the market in the first quarter of 2018 to a 34 percent share. It is suggested the growth in shipments was aided by "stellar performances" by Fitbit and Garmin, swelling the market faster than the Apple Watch's own growth. In the first quarter, Canalys estimated Apple shipped 3.8 million Apple Watches, an increase of 35 percent year-on-year. The firm believes Appe saw considerable growth in shipments for Asia, excluding China, surpassing 250,000 units for the quarter. 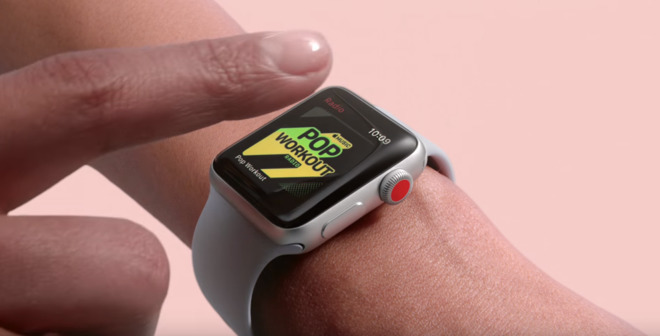 The LTE edition of the Apple Watch Series 3 also received praise as the best-shipping watch for the markets in the quarter, accounting for approximately 60 percent of Apple's smartwatch shipments. "Apple's decision to expand internationally with operators has quickly reaped rewards in Asia Pacific," advises Canalys Senior Analyst Jason Law, noting partnerships with carriers in Australia, Japan, and Singapore since the launch of the Series 3 range. Carriers in Thailand, India, and South Korea made deals to distribute the model in the last quarter. Law continues to suggest the operators in these markets are willing to resell connected devices other than smartphones, to generate extra revenue from data services. "India is a surprising addition to the list of countries," adds Law. "But this is a good strategy by Airtel and Reliance Jio to retain their high-value customers in a bid to maximize churn in a cut-throat market." Canalys' analysis follows a similar report from IDC earlier this month, which claims Apple improved shipments 13.5 percent year-on-year for the quarter to 4 million Apple Watch units. Estimates and analysis from Canalys, IDC, and other firms may differ from Apple's actual results, as they are sourced via third-party data, such as sales and shipments passing through carriers and other entities. Apple also doesn't provide exact details about Apple Watch sales, making monitoring the product's performance especially difficult. Apple is expected to reveal a redesigned Apple Watch with a larger screen, better battery life, and improved health features later this year. Few rumors have surfaced about the wearable, except that it is likely to stay similar in design to its current shape.